There is a certain conceit to the idea of adult coloring books that may beget an eye roll (or two or ten). By the time my editor asked me to research and write about adult coloring books, I had already been testing several for weeks, in part because they have become a pop culture slash multimillion-dollar publishing phenomenon. Last November Publishers Weekly declared coloring book for adults “this year’s smash hit category,” which was only gaining steam heading into the gift-buying season. 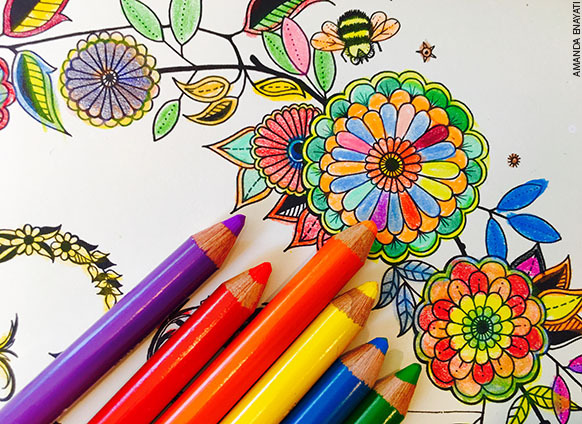 And although I am still torn about whether the mental health claims amount to little more than the hype of clever marketing, the buzz among the users I interviewed was remarkably consistent: People love adult coloring books and find them immensely useful. Engaging in the arts is well known to have significantly positive impacts on health. Arts therapy has been used clinically for more than a century as a way of improving people’s physical and emotional well-being in the face of a variety of diagnoses, including cancer, asthma, diabetes, depression and anxiety, and dementia, among others. Jung’s practice has been continued by psychologists and art therapists, who recommend coloring to their patients as a healing medium with a host of purported benefits, ranging from mindfulness and creative flow to stress and anxiety relief to greater focus and enhanced dexterity. The laundry list of is long, but remains mostly anecdotal. “With art therapy, you are trying to get people back into their bodies and feelings by engaging them with materials and in the process of using those materials,” observes board-certified art therapist Joan Stanford, author of the upcoming book The Art of Play: Ignite Your Imagination to Unlock Insight, Healing and Joy . Entrepreneur Leisa McNeese began to use coloring books at the tail end of a year of near-constant illness. “It began in October with the flu. The flu turned into bronchitis, which put me at risk for pneumonia. By March I had a chronic sinus infection.” Several courses of antibiotics later, she began suffering from tendinitis—she suspected it was from the antibiotics, but her doctors wondered whether she might have rheumatoid arthritis. “I realized I had been sick for nine months and I was experiencing constant headaches. Something was very wrong,” says McNeese. It had been an eventful year: McNeese had just sold her company. She was raising two young daughters and her husband was traveling frequently. “I knew I needed to deal with the stress. I needed to find another way to manage it,” she recalls. With her husband out of town, she couldn’t run out for regular exercise classes, so she looked for something she could do at home. She had seen an article on Facebook about adult coloring books, so she ordered several from Amazon, along with colored pencils. “In May I told my family that I just needed to be sick for a while,” recalls McNeese. Something amazing happened: Once she finished the latest course of antibiotics she was taking, she didn’t need another round for the first time in months. By the beginning of July she was feeling better, to the point where she could cope and function again. Poet and writer Kathryn Bass and her husband, graphic designer Joel Bass, enjoy adult coloring books because they find them relaxing and meditative. Kathryn and Joel first began doodling together using the Zentangle system, a method popular with artists who find it helps them quickly enter the creative flow state. And while coloring books are more directed, the Basses enjoy them for many of the same reasons. 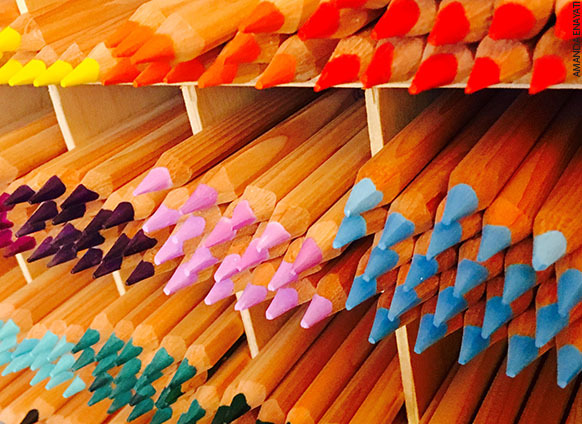 “The mental chatter you have when you try to meditate also shows up for me when I start to color,” says Kathryn. “There’s that moment when I’m confronting the page and feeling the resistance, thinking I’m not sure I want to do it. I will often start often with a repeated shape. The small motor hand-eye coordination frees my mind and lets me get comfortable and relax.” It’s a feeling of play with some improvisation, but not a threatening amount of improvisation. Coloring is a trendy and social way to make art approachable, says Joel, since a lot of people can be threatened by the idea of making art. You’re enriching yourself, but it’s not too overwhelming or daunting. As artists, Kathryn and Joel both take a great deal of license within the page, adding patterns, textures, and vivid, metallic inks. For the Basses, there’s another important benefit to coloring. As introverts, they report feeling particularly soothed by an activity where they don’t have to make eye contact, but can continue to talk. “We can share experiences and talk with each other, but there’s less social pressure,” says Kathryn. McNeese likes good colored pencils better than markers or pens because she finds they provide more subtlety, shading and depth. Kathryn, though, says, “We don’t really like pencils as much as we like markers. I like the deep color saturation. I also like the felt tip against the paper and the fact that pens don’t need to be sharpened.” She recommends Staedtler 0.3mm pens , which do not bleed through. (“A lot of others do.”) Both Joel and Kathryn like Gelly Roll gel pens, because of their oeuvre of metallic and unusual hues. The hype associated with adult coloring books has hit a fever pitch, and there is little doubt that many people are finding them both enjoyable and beneficial. In over 20 years of practice, Joan Stanford has found that many people feel an urgent need to engage in something creative in their lives. She believes that coloring has the potential to relieve stress and anxiety, to bring mindfulness and presence, and to help unleash creativity and play in a way that is quite safe.